We aim to achieve the best design and user experience – offered for a competitive price. We are happy to advice on any of your digital marketing challenges. Accounting firms Abeceda and EKOS Celje belong to the same owner. There was a need for a simple, yet attractive and professional looking joint web site. We were also trusted to develop corporate identity. Both brands are standalone services, but are connected through common logo elements. 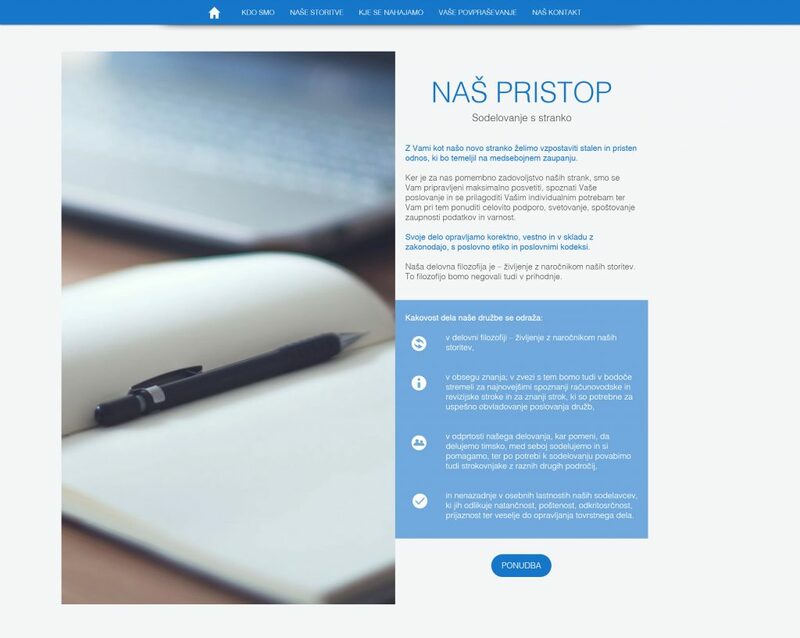 Unifying corporate identity and its web presence, racunovodstvo-revizija.net is our choice of presentation for the BASIC service. This is the minimum to expect if choosing to work with us. Our BASIC service delivers what most organisations are looking for in order to represent their online presence – most common web features, such as About, Services, Location and Contact. Make your inquiry for our BASIC offer! Travelling blog TOP potovanja (TOP travels) is a rather complex site due to its need for dynamic content updates on daily basis. The site highlights various search forms in order for user to find his next TOP destination. In addition, traveling is a very competitive online branch which makes it difficult to rank in search engines. Therefore SEO, SEM and social media marketing needed to be engaged in order to support the site flow. Finally, monetization is what makes this site really unique. Implementing advertising, scripts of several affiliate partners, analyzing key targets via Google Analytics and Tags was a technical challenge as important as design itself. All of these advanced techniques make TOP potovanja travelling blog our choice of presentation for our PLUS offering. PLUS basically means, that additional input behind the wall is needed in order to achieve desired results. Make your inquiry for our PLUS offer! Capturing the ‘What, Where & Window of Content Distribution,’ MediaBiz is a US based data aggregation company which is setting industry standards in video content availability across all devices and video providers. Their services rely upon comprehensive data collection activities, unique quality control systems, and advanced analytics, providing detailed availability metrics for the non-linear and linear media professionals. With our roll in project management, Felicijan Sedmak fine design contribution and Specto programming skills, new corporate identity launched its innovative products with multiple mobile and web applications. The need for collaboration between several unique professionals makes MediaBiz site special and therefore our choice of presentation for our PREMIUM offering. PREMIUM means, that we can provide any customized solution. Make your inquiry for our PREMIUM offer! Interested in web design blog logo new corporate identity SEO and SEM Facebook Marketing Instagram Marketing ? Contact us!